What if you could explore America’s natural wonders each month? I am excited to announce Handmade Travel’s first ever yarn club. This monthly yarn subscription will feature a new colorway each month. 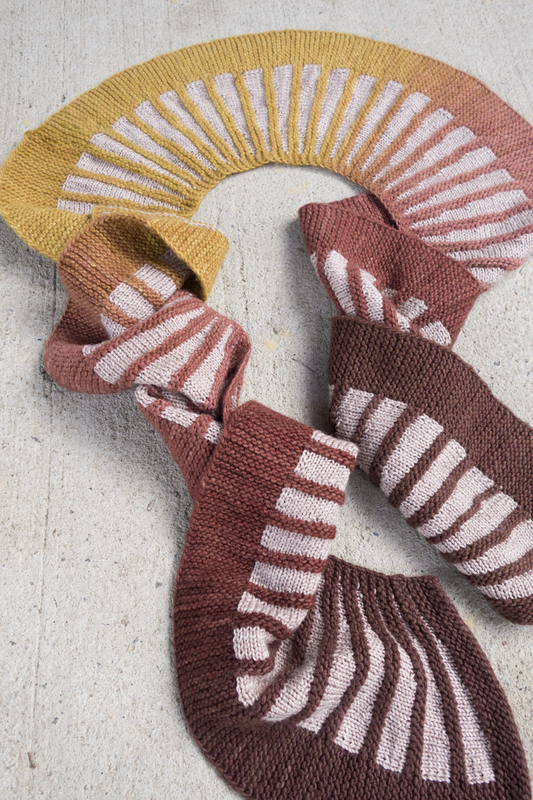 The colorways will be exclusive to yarn club subscribers and will draw inspiration from a different National Park each month. The club will begin in February! Each month’s listing can be found in my Etsy shop. -- Our National Parks , 1901, page 56. P.S. Here is another photo from the yarn I recently finished. Stay tuned for stories from our upcoming US National Parks road trip! I am super excited every time I finish a project. I usually make my husband stop whatever he's doing so I can show him my finished object. His first question is, awesome so it's ready to (insert appropriate verb here) wear, use, snuggle with? Well, not quite. I squeal when I'm finished knitting, when I'm finished sewing in ends, when I'm done assembling. Generally, I say I am finished way ahead of the actual end of the road.... I may on the summit, but there are so many exciting moments very close to the summit! This time, I am finished making yarn. One day soon, I will start using this yarn to make a blanket. Before that though, I went through a whole heck of a lot of work to get this stuff to be what it is. I got 1kg of White Gum Wool tops from a fiber swap. It took a lot of self restraint not to cuddle with the wool. It is so darn soft. I had also recently read about Helen's method of spinning gradient yarn from dyed tops with short color transitions. See her post here. Since variegated yarn doesn't tickle my fancy... but playing with tons of colors in the dyeing process does, I decided to give try out her method. This was my first time working with White Gum Wool as wool and not yarn. Later on I realized that Nan sells it as slivers, so it is a bit thinner than other tops. I wondered if it was much more likely to felt because there was so much surface area to handle. I began by soaking the slivers in a bucket of warm water for a few hours. The bucket was filled with water and then the wool was added. It was slowly pushed down into the water until all air bubbles had been released. Meanwhile, I mixed Greener Shades pigments with boiling water to make my 12 starting colors. I mixed 4 'primaries', a deep blue/grey. a burnt red, a mustard, and a teal green. These were not straight from one pigment, but mixes of a few. These four jars were then mixed with their neighboring jars to create gradients between them. Doesn't this awesome color wheel help you understand my mixing process? Don't worry, it worked at the time. The wool was in 100g segments. Each segment was laid into a baking tray. The strands were carefully laid next to each other so as not to cover neighboring strands. I was really nervous about the dye missing areas. As you can see above, I turned on the horizontal (long) edge of the pans. This would give me short color changes in my dyed wool. After all the wool was laid out in trays, 100g per tray, I started adding the dye. The three colors chosen for each tray included one of my primaries and two secondaries from opposite sides of the color wheel. For example, in the photo below, I used my original yellow, the slightly yellow side of the red and the slightly blue side of the green. This bit took a long time to do! I carefully laid a spoonful of dye onto the wool and let it soak into the fiber. Each tray might have taken about half an hour to cover in dye. It's not quite visible in these photos, but I did have several layers of wool built up. Once I had the wool saturated with dye, I put the trays in the oven at 160 degrees C for a half an hour without agitation. After the half hour passed, I added a touch more water to the pans and about a tablespoon of citric acid to each. I gave them another ten minutes or so for the water to heat back up and the acid to soak in. When I took the pans out to have a look, shifting the wool around showed that the top layer of wool had soaked up all the dye. It didn't penetrate to the lower layers even though I had tried to let it sink down when adding it. In order to get the dye throughout all 100g in each tray, I transferred the fiber to another tray, laying the strands down a few at a time, adding dye as I went. This put dye in between each layer of fiber and next to each strand. In hindsight, I should have done this from the beginning. Oh well. I then put the fiber in the oven for another half hour, adding citric acid towards the end. It's worth noting, nearly all of the color had been absorbed prior to adding the citric acid. I then rinsed each tray with warm water and wool wash. To do this, I slide all of the fiber out of it's baking pan into a bucket or sink already full of lukewarm water and wool wash. I let that sit for a few minutes to let the fiber cool down. At which point, I slowly pick up the sliver of fiber and begin draping it over my hand meanwhile there is cool water running over the fiber on my hand. The water is turned on here at a very low pressure. None of my fiber has ever felted on me. I'm not entirely sure why, as I do handle the fiber quite a bite during the dyeing process. Perhaps doing it very slowly is the key...? After rinsing, the fiber was laid out on a towel, rolled up and I pressed out the excess water. It was then draped over a drying rack. The roving was not touched at all until completely dry. See my finished braids!! I was so excited about these colors. It was darn hard to keep going with my plan because I wanted to see what these looked like spun up without further processing. I trusted my initial instincts and went forward with the plan though. The next step was to separate the colors. By pulling apart the different colors in each sliver. In doing this, nearby colors were on the edges of each chunk. Sorry for the horrible photo. Sometimes, I only have my phone and poor lighting. Now that everything was divided, I grouped like colors to create gradient colorways. For example, I took the brightest yellow, an orange, a red and a brown bunch to create one skein. I could have stopped here and started spinning. I think doing so would have created a yarn with much more distinct chunks of color throughout, almost a variegated gradient. That's not what I was going for, so I began carding each section of color with my hand carders. In carding the chunks of color, the extremes were blended in to make a muted tone. See above where the intense red and yellow gets lost into a reddish-orange. Brushing back and forth about 4 times achieved a semi blended color that I was happy with. 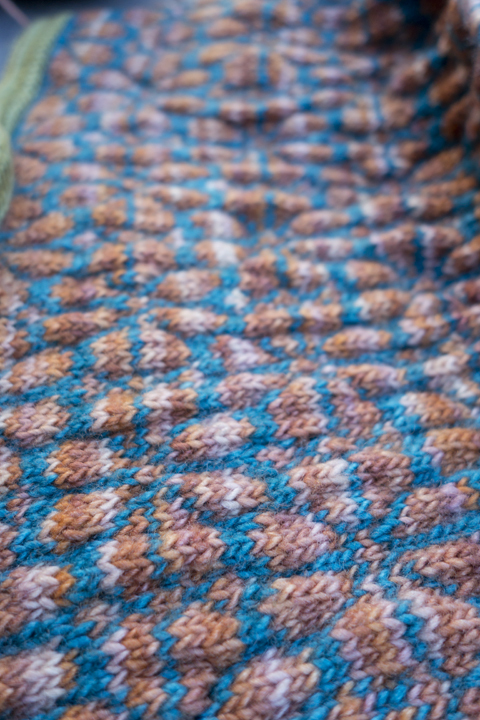 Each color pile was blended, creating little rolags (or folags). Afterwards, I laid out the colors that were to become one skeins' gradient. I then grabbed two rolags from each adjacent color and blended these. This way each color change was a bit smoother. I don't have any photos of this step. I also don't have any photos of the spinning progress. I was way to excited about the process to document. Sorry everyone! I spun each rolag by opening it up and pulling from the fold. In doing so, I made a semi-woolen single. The singles were then navajo plied. I did this for two reasons. First, I wanted to create a pretty thick yarn. Second, I did not want to worry about splitting up the colors and making two singles exactly the same such that the gradient would flow nicely. By navajo plying, I didn't have to worry about where the color changes happened; they blended in nicely with the other two strands that created the finished yarn. 1: Tag a friend who could use a yarnie surprise in the comments section. 2: Tell me something about your long distance pal and what color yarn you would love. That’s it! In doing so, you AND your friend will be entered to win a skein of yarn and a project bag. It’s not always easy keeping in touch over log distances. Here's a reason to chat this week, free yarn! For an additional entry, share this post and tag me in the comments! We are all made up of stardust. Therefore we are all connected. I was told throughout college that I needed to visit another landscape before I could call myself a landscape painter. 'You have to leave so that you can choose your color palette. Right now, this is all you know.' they said. I love the colors of North American Forests. Nothing can compare to the greys and greens of winter there or the granite of Yosemite. Then again... The Australian landscape has added richness and warmth to those cool winter greens. Oil painting may not be my focus at the moment, but I mix colors just the same when I dye yarn. I didn't know what I was missing until I moved around the world. The dyes I use are comprised of 9 colors, two blues, two reds, yellow, purple, orange and black. Some companies offer upwards of 30 pigments! I love Greener Shades dyes. Not only are they the least impactful pigments I have found with regard to their waste, but the limited range of starting colors means I get to play as I create each dye bath. Take a look at some of these colorways from yesterday's dye batch. Happy New Year Everyone! I have lots to share. A new president was inaugurated. Marches happened around the world. 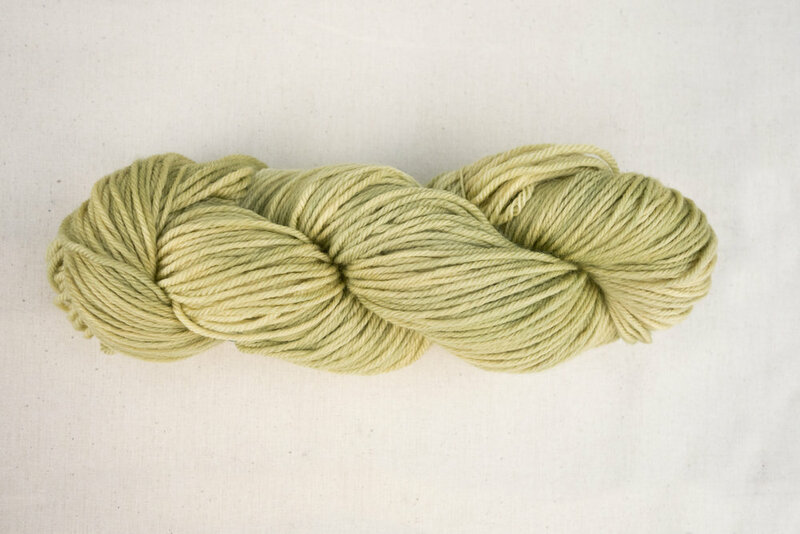 At the moment, I am worn out and want to look at pretty pictures of hand dyed goodness. All I can do is try to reduce my impact on the world. Which brings me to all of these goodies. Everything below is made from Australian sheep. processed in Australia or New Zealand and dyed by me. These tops and yarn has a small carbon footprint. The rest is up to us. Wow! Just wow! Yesterday I participated in my first local market as a seller. 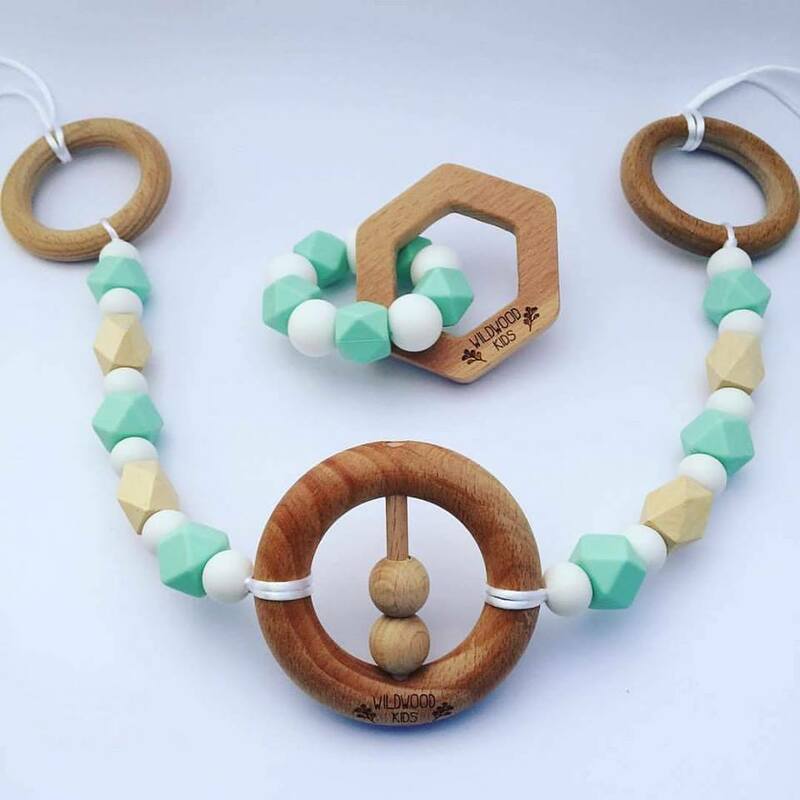 A few women from the Blue Mountains organised an Etsy Make Local Market for our area. These are events that happen on the same day all around Australia. As an Etsy seller specializing in handdyed and handspun yarn I was eligible to participate in the market nearest me, the Blue Mountains. Our organisers, Nisa, Caroline and Jenny did a fabulous job. The Norman Lindsay Gallery was kind enough to host the event. Every one of my visitors complimented the layout of the space. It was very open, which invited people to sit on the grass and enjoy their day. I had quite a few people come back through my stall after they had lunch. The space created an atmosphere for an afternoon out rather than just a quick wander through the market. The previous photos were taken before the day began. Trust me, people came. Apparently, there were around 4,000 visitors! I'm not sure how visitors were tracked, but one of the organisers said that's how many total people came to the market. As a first time stallholder (in Australia), I couldn't be happier. Leading up to the event, a Facebook group and decorating night revealed a supportive network of crafters. A lot of the stall holders helped each other navigate credit card readers, stall set up, and other logistics. I think I may have found a few more friends. Thanks everyone. I hope you had a great day too. My experience as a business went really well too. I may have come home with a lot of yarn, (who could be sad about that?) but the load was significantly lighter. I hope everyone enjoys their yarn, bowls, bags and other things they bought from me. 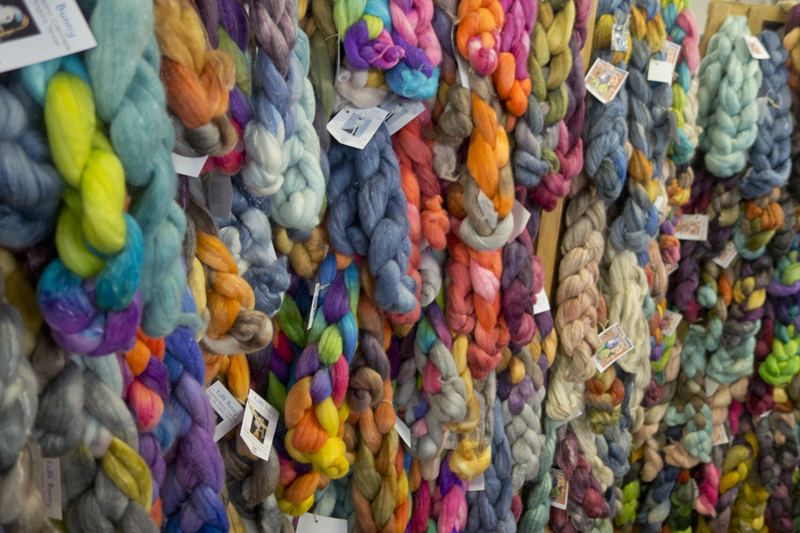 I connected with fellow crafters and chatted a lot about the production story of yarn. I am working towards a supply of yarn that is solely produced in Australia under humane conditions with minimal carbon footprint. Some of my yarn already falls under this category; it's a work in progress. Thank you for taking the journey with me. At the end of the day, I want to help my customer's get a product they are excited to use and eventually wear. If you want something special, or have your own fleece / yarn that you want me to dye for you, get in touch. I would love nothing more than to work with you to create yarn especially for your project! My FIBER page located under the PROJECTS tab, will give you an idea of the things I am driven to make. Feel free to email me if you would like a garment made to fit your body. My Etsy shop has ready-made and made-to-order items, but please don't hesitate to contact me for a custom order. Thanks to my husband. John was with me the whole day. From setting up to taking sales and colour recommendations, he did it all! I couldn't have had a successful day without you. You will make a fantastic business partner ;-). Thank you also to my friends who lent me tables and branches. That means you Danielle and Jillian, thank you for being wonderfully giving friends. Thanks to my fellow stall holders who answered tons of questions from the novice American stallholder. Finally, thank you one more time to the organisers, Nisa, Jenny and Caroline. Yesterday blew my expectations out of the water! What a fantastic market. I look forward to the next one! P.S. If you bought things from me, I would love to see how they fit into your life. Share your story with me on Instagram, Twitter or Facebook. Today John and I headed out for an adventure to one of our regular crags, Shipley in Blackheath. The on;y difference was we checked out a new area. This was an area we have been wanting to climb for a while. We headed down to do the multi-pitch trad line called Clockwork Orange. I definitely recommend this route. Perhaps don't try it in gale force winds though! We need to go back again on a better day. So what do you think? Is this bomber? Or why did I bother? ... The load was spread over about 5 other pieces in this awkward belay. We all have a yarn hall of fame. Or is that just me? These are the fabulous yarns that I couldn't live without. I got them off Etsy or last years Wool Show at Bendigo. They were made in small batches. No matter how perfect that skein might be for a specific project requiring three more skeins... there is no hope of getting more. No matter how many times I email the maker, they cannot do it. They feel bad, I am sad, and so the yarn continues to sit there taunting me on the shelf. I hope that won't happen to the yarn you buy from me! I want you to use it. If you don't, give it back to me and I will make you something out of it! Perhaps not. Still, I want you to enjoy it as something you made. With the holidays coming and a market on the horizon, here are some things you could do with my yarns. "I Can Only Afford One Skein of This"
I get it. Locally produced and hand made products are expensive. That's the life of paying fair wages and responsible sourcing. Enough about that though. You want one skein? Great. How many projects can come from one skein of yarn? Certainly not a sweater.... Consider these options. Hats, gloves, socks, even some shawlettes only require one skein of yarn. Baby clothes are always a winner, they're so little! However, I recommend thinking hard before making a delicate item for a puking & pooping little one. No matter how cute they are, this probably won't be machine washable. Do you love larger projects? Perhaps you think that lovely yarn deserves to be more than just hats and socks. Don't worry, I get it. How about adding a bit of color to a larger or more interesting stitch pattern. Check these out. To those thinking this is a great option, BE CAREFUL! Matching gauge won't be crucial for patterns like Solaris, Hudson and Fluer de Love. The others however, require very careful gauge matching. This won't be difficult with commercially spun yarns, for example most of my hand dyed. However, hand spun yarn is trickier, not impossible, to match exact gauge to another yarn. If you are having trouble, email me! I love figuring out the math behind getting yarn to suit the pattern. Truth be told, I don't love it, nobody loves that. I DO love helping you get what you want! The final option is do your research ahead of time.... or in the shop/stall while you are clutching onto that yarn for dear life. I've done it! No one else may even look at this yarn while I troll Ravelry to find a perfect pattern. I haven't gone to the length of laying on a shelf so as to protect a whole area of yarn, but don't underestimate me! I have many years ahead of me. So hop onto Ravelry. Ask to borrow my phone at the upcoming market if you don't have internet access. Find what you want to make. I will even give you a high five if you come to me with a pattern and say, "I want to make this with your yarn. Help me find the right weight/yardage/color." If I don't have it at the moment, I will work with you to make something just for you! Come down the rabbit hole with me for a minute. I started knitting because I couldn't find things I liked in stores. I also need to constantly make things to stay sane, minor detail. This taught me to care about where things are produced. A sweater might take 40 hours for me to complete; that's between $330 (Illinois, USA) - $675 (Australia) worth of minimum wage time. Granted that's a complicated sweater if it takes 40 hours. Then I think, how much time did it take to make that yarn? Where did that yarn travel before it got to me? Did it take 3 trips across the Pacific before it arrived at my doorstep? What is my ecological and ethical footprint of getting inexpensive, albeit quality, yarns manufactured in China? If you are curious about my yarns origin story, ask me. I will tell you everything about where each skein was made, how the animals were treated, why I bought it and more. If you have the means to buy large quantities from small retailers, you generally won't be disappointed. Ask before you buy. Give the causes you care about a voice. Do you want locally made and produced yarn? Do you care about mulesing and animal welfare? Informed consumers drive the market. Send emails to retailers. I sure do. I am very undecided about whether or not I want to let this set go to a new home. This is some of my hand dyed yarn. It's a gradient set with enough yarn to make an adult sweater. That means it has more than enough to make accessories, all things baby, and more. It is listed on my Etsy shop for the moment. If I find the perfect project though, it may just disappear and reappear in one of my project bags for personal use! This is why I will never be able to have a serious business... I keep using the things I make! Who am I kidding, I love it! A new item at the shop is the rope bowl. I'm not going to lie, these are currently holding yarn and fiber. I will use them until the say they sell! The last items I will highlight are the variegated yarns that I just made. These are a blast to dye. I get to play a lot more during the dyeing process with adding bits of color here and bits of color there. The semi-solid process is a lot slower and requires patience. Sometimes, however, I just want to go crazy! This yarn is called Banksia named after the leaves and flowers of the Banskia tree outside my house. I am getting stock ready for the upcoming Blue Mountains Etsy Sellers Market on November 19th. This is my first market since moving to Australia. Come out for a day in the mountains and say hello! The Market has a an event page on Facebook. Look them up. In the meantime, look at some of the awesome items that will be fore sale at the market. Have I told you that I finished my Zig Zag sweater? It's actually called the Maijapaita Pullover, but I have no idea how to pronounce that hence the zig zag. I'm pretty excited about it. It's finished right in time for summer! Oops. Luckily today's winds are supposed to be blowing at 35 km/h and the temperature high is 9C. The yarn is Cascade Yarns Ecological Wool. It's definitely too scratchy to be a next to skin garment. It's very different than any of my other sweaters. The yarn has left a halo of fibers sticking out here and there. They add a bit of character to it, which I enjoy. The cable at the yoke was particularly tricky for me to follow. I don't recommend putting this project aside for a week or two and then attempting to read your own scribbles to remember what row you left off on. Get to the point of working in the round quickly. Once there, it's very easy to see what row is next. Alternatively, use locking stitch markers on previous rows to help keep track. A few false starts almost made me give up. I'm glad that I persevered though. The majority of the sweater was easy and fast to work on. Now, what kind of obsessive maker would I be if I didn't immediately cast on another project when I finished this one? Don't you dare say a responsible one! ...please...for my sanity's sake... I've started making Kira the kangaroo. 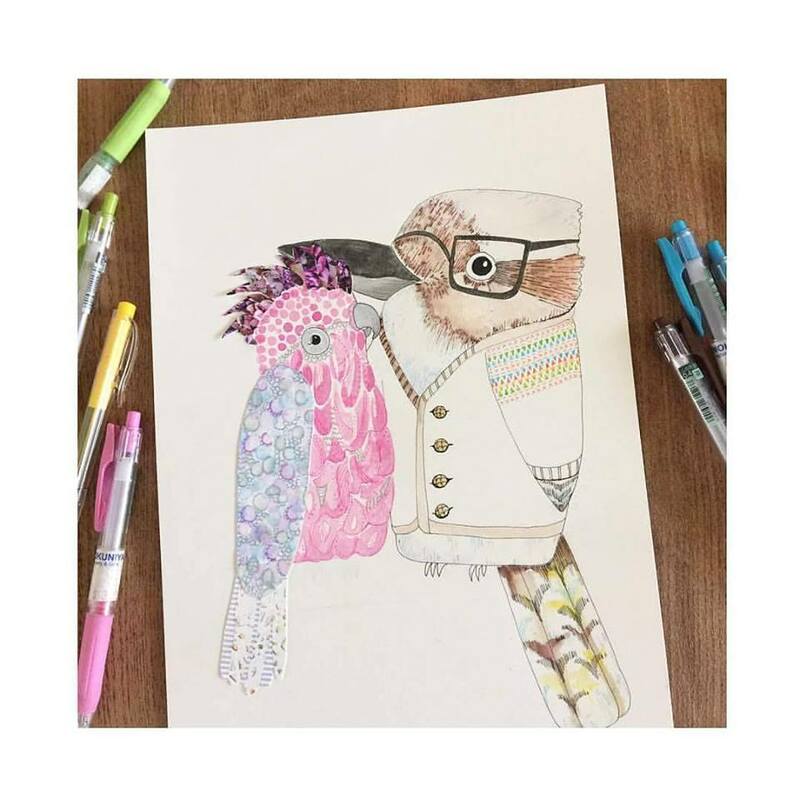 Don't ask me who it's for... Lydia Tresselt's stuffed animals are so different and adorable! I have to make at least one. Check her out if you don't know of her work. The animals seriously quirky and awesome. I need to get on my bike and shiver off to the yarn shop for work. Have a good Thursday evening / Friday depending on where you call home. Cheers! I have so many new things that I want to share here. The time it required to shoot and edit photographs takes me away from making things. I do want to share my adventures and connect with people... but I also want to keep playing! For now, here are a couple of finished projects. Do you hear that? I'm finishing things! This is rare people. I finally finished the Maeve bolero/cardigan. It is very snuggly. This pattern was desperately monotonous to make. Aside from increases, it was plain knitting. If you're looking for a low-fuss pattern, this may be for you. The result has wonderful drape and sits perfect on my shoulders. This concerned me initially because there isn't any shoulder shaping. Those concerns vanished as soon as I tried the sweater on. I'm really happy with the result. It shouldn't have taken me so long to complete. However, I love the challenge of figuring out a pattern. Once I feel like I've wrapped my brain around how it works, I really struggle to finish the project. This was one of those for me. In the future, I really need to remember that sometimes (!) it's about the finished product less than the process. I bought a spinning wheel! A friend had let me borrow her spare wheel for the past ~8 months. I can't believe she let me have it for so long. Thanks Helen! Last week she finally asked for the wheel back. Of course this happened two days after I got a large package of wool to spin! So I acted as any rational person would do... the rational person that is beginning to twitch from not spinning for two days... I found a used wheel online and bought it four days later! Say hello to my little kiwi. This is a great beginner wheel. I absolutely love it! It even has an engraving of a kiwi on the right foot pedal (not the fruit or the people). So... Take a look at my recent hand spun yarn! The blue is 100% merino (20.7 micron) from Kathy's Fibres online shop. The grey is naturally colored Corriedale from Karoa Fibres. I can't decide if I want to knit these or sell them. 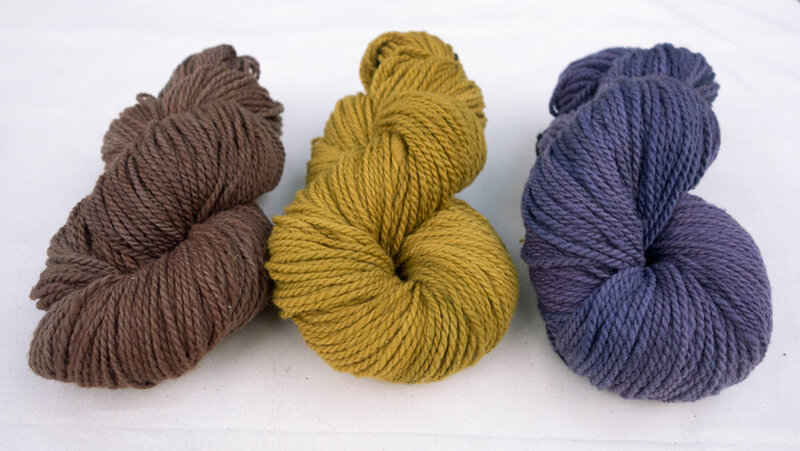 They are 8ply/DK weight, 100g of the blue and 50g of the grey. 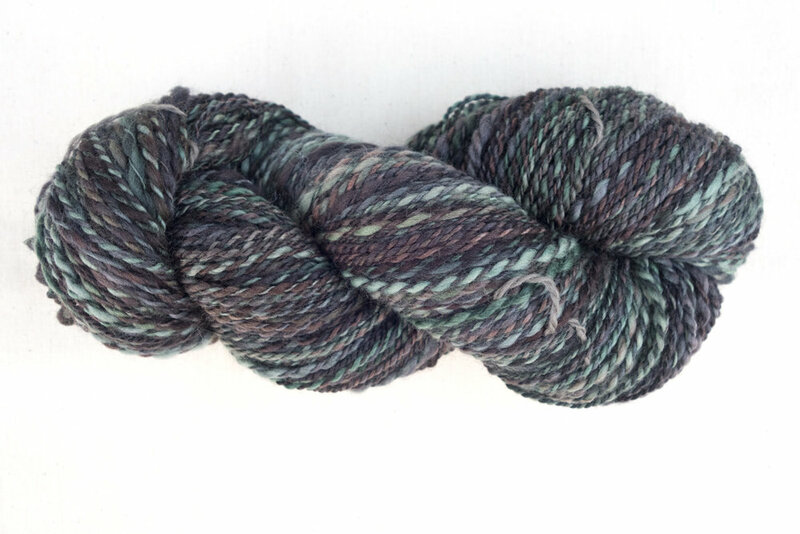 I have another 150g of the grey waiting to be spun. If by chance I knit them up... Liguria is the pattern I would choose. I think it would highlight the blues and greens without the color jumbling that usually happens with variegated yarn. The brioche and grey contrast would minimize that. What do I do? I don't spend all of my time inside tinkering. My weekend days have been full of climbing. One by one I've been ticking off projects at Mt Piddington. I've now led the Eternity, Pharaoh, Carthaginian, Tombstone Wall, Rogue Cop (or something like it), Flake Crack, among other easier routes. I got up On Edge on top rope this past weekend. Hopefully next weekend I will give it a go on lead. I'm also really keen to try The Janicepts... on top rope. Let's not get crazy. I need to get just a bit (emphasis on a bit) better before I'm in the head space to lead that one. Anyways, most weekend days you'll find me at Piddo. It's a good thing John is similarly obsessed. I don't even think we ask each other where we are headed anymore. We rack up and pack our bags knowing it's going to be a day of trad climbing at Piddo. I love it!... and him! Coincidentally, this is not a picture of Mt Piddington. This was taken at New York on The Big Corner. It's the most recent photo I have of me trad climbing... so yea. I still love Piddo! This is better. Here is a picture of John taping his hands to lead Amen Corner and The Janicepts at Piddo. I have so many more things to share. New paintings, upcoming markets, product reviews... I'll save that for the next post. Have a good week y'all! It's Friday morning. I head into Katoomba early for my weekly pancake breakfast before teaching. I look forward to this time all week. I sit at the cafe, by myself, and knit as I wait for breakfast to arrive. My cafe of choice is Clean Slate. The place is always busy, which makes me feel a part of the local scene. The dynamic is just right so that I can have a relaxing beginning to my day. Withot fail, someone strikes up a conversation with me about my knitting. They interject my meditation by saying, 'good for you, doing something other than being on your phone' or 'it's not often to see a young person knitting.' I usually smile and say 'it keeps me sane!' We have a bit if a chuckle together and that nearly always acts as an introduction for them. This person then tells me an anecdote about how busy their life is and how they should really slow down to learn how to knit. This morning an older man went through this all too familiar repitoir of conversation. He followed it up by telling me a story. He, it turns out, wants to learn how to knit something for a baby that recently came into his life. As someone who seemed to be well past procreating years, I thought this was a curious thing to say. I did not yet know this man, so I did not inquire but instead smiled. He followed up by saying he wants to give this baby all his love because the baby was a product of a heroine addicted pregnancy. At this, I said that sounds lovely and I can teach you if you want. We spoke for a minute about how I teach at the knitting shop down the street, that he knew nothing about. This man then moved over to my table without invitation. He proceeded to ask me my opinion on this child's future prospects. Would this baby, who is now in the loving hands of his grandmother have a chance at a good life? I could see the pleading in his eyes. He hadn't planned to open up to a perfect stranger. But there he was, completely vulnerable needing a bit of reassurance. I prefaced my answer by saying I am not educated to give an answer to this. From what I heard, this child will be nurtured and supported and have a great chance to be grow up to be a wonderful child. He beamed! Shortly after, he excused himself. He wanted to go home and tell his partner that he was going to learn how to knit. He said he couldn't wait to see the look on her face. I've come to almost expect these encounters when I knit in public. Somehow this craft is an invitation for conversation and support. Sometimes, I admit that I get talked at for an hour and it's horrible. Times like this morning invigorate me. Someone opened up to a perfect stranger for a moment. It was lovely. Feel free to come up to me if you see me knitting in public. If i might speak for all artists here.. If you need a friend, we are always here to listen. Looking back, new friends build a tandem from two old Schwinn Varsity frames. 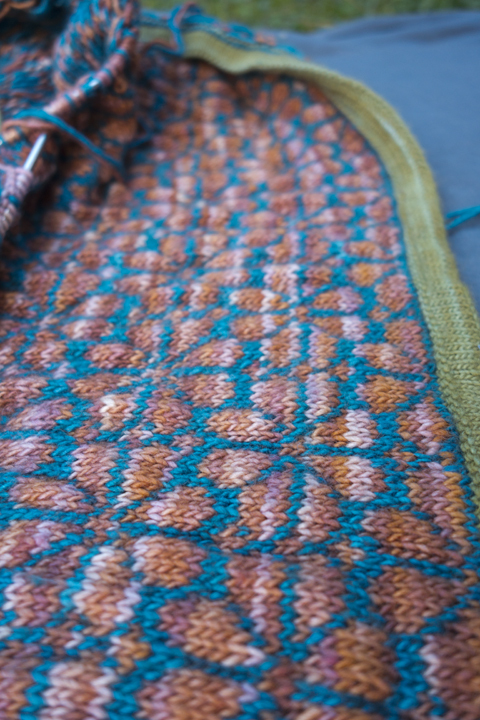 This week, I noticed something very disturbing in my current fair isle knitting project, Urban Mandarin. The fabric was wavy and bunched in places. Ahhhh! This hot mess is painful to look at! Fabric bumps are caused by the yarn being help too tight when it is carried behind the work. If you're not familiar with fair isle knitting, this might be gibberish. In fair isle, only one color is being knit at a time, the other strand of yarn gets pulled along on the backside of the work until it is used a few stitches later. If you are not careful, the stranded yarn will pull the fabric together and create these bunches. As I got comfortable with this pattern, my tension has relaxed. Therefore, the fabric closest to my needles lays nice and flat; i.e. no waves. I was terrified that the whole project needed to be frogged. Frogging is a term for ripping the entire work out and starting over. That's about 10 hours of work right there! Luckily, my awesome co-worker at the knitting shop calmed me down. Imogen told me to steam a small piece of the fabric and see if the bunches relaxed. If they did, I could chill out and keep working. If they didn't.... well I would cry when the time came. To block a small area: Wet a towel. Place that towel over work. Press with an iron for a few seconds. Lightly stretch work. Repeat. Imogen to the rescue. Steaming worked! It will all be beautiful when it is blocked (that is steamed / washed) when I am finished. Phew. Here are the before and after photos. The right image isn't perfect, but blocking a portion of a fabric is difficult. I'm confident it will look so much better when I work with the full garment. Never Frog Anything on a Friday! It's been a long week with the stress of work. Leave it alone until Monday, go for a hike instead. My day off today is met with rain and cold weather. I feel like snuggling up with some good music, tea and my knitting. 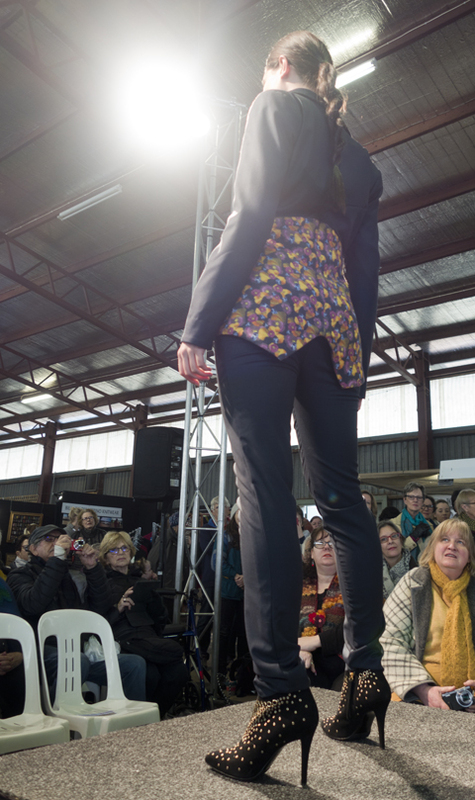 This weekend was the Bendigo Wool Show. 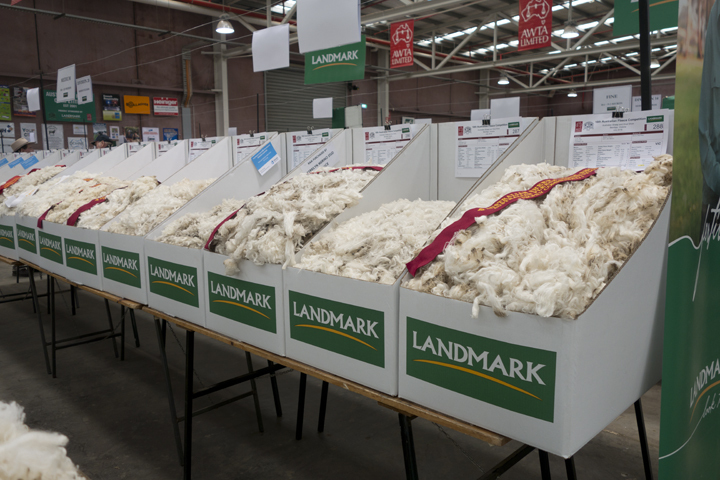 It's the biggest wool show in all of Australia bringing together sheep, their farmers and wool craft. At the last minute, I cancelled all of my classes, rented a room off Airbnb, and headed for a weekend away. It was spectacular. I love to travel with my husband, but every now and again I want to do something that doesn't interest him in the least bit. This was one of those trips. I left John at home. I had a fantastic weekend! The show was excellent. 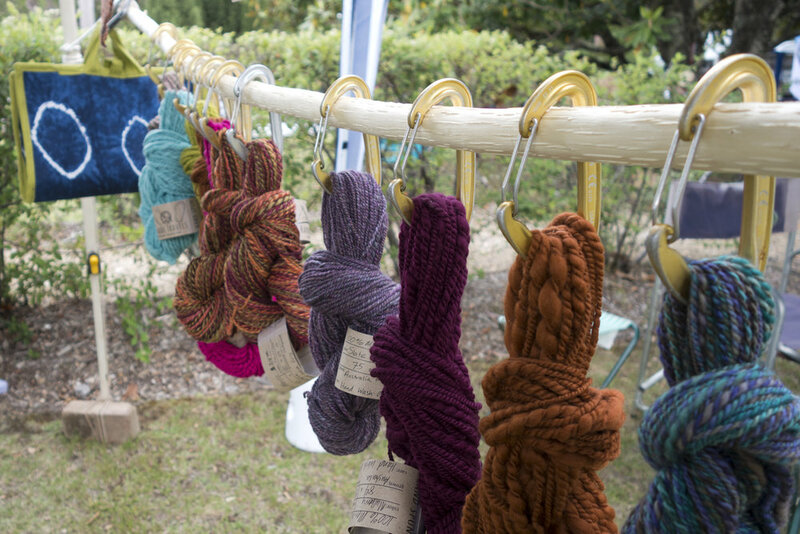 Imagine sheep, farmers, fiber, and makers coming together to share their craft. It was phenomenal! I was out of my league in so many ways and took lots of notes. Hearing people talk about Polwarth or Corriedale sheep, having grown up in Chicago suburbia did me no favors here. 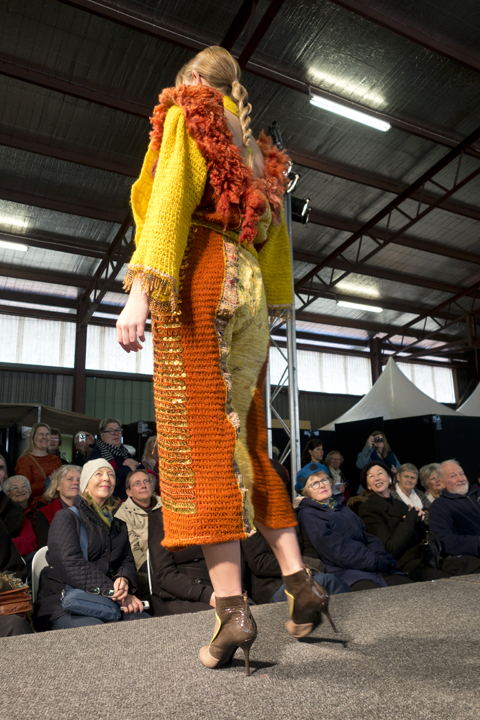 I first got into knitting because I wanted to be more involved in the production of my garments. 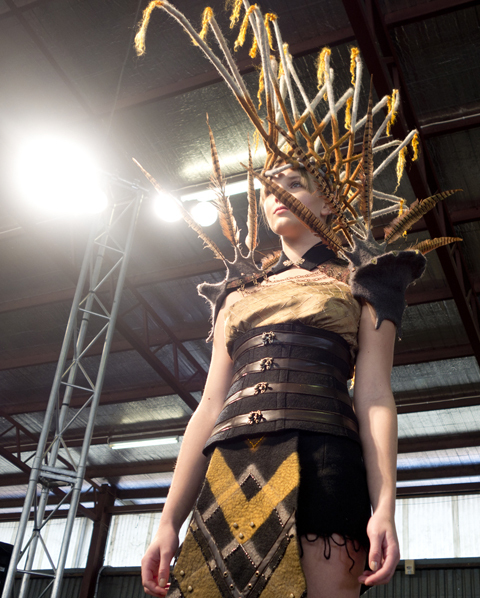 I wanted to understand how my clothes are put together and the amount of work that goes into making a garment. This is only half of the story though. My explorations have led me to hear about different fibers, production methods, and animal welfare. The show was a great introduction to wool production in Australia. 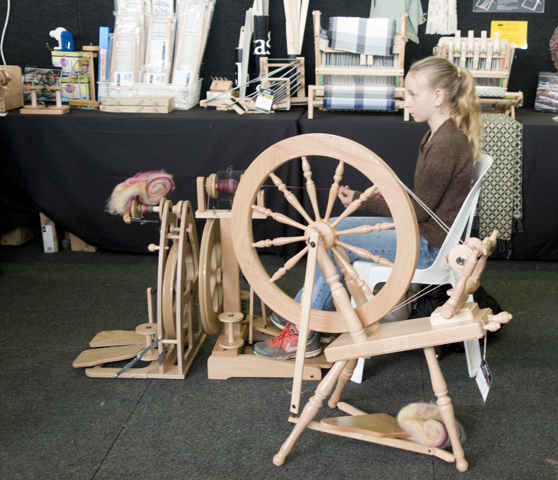 I was in the right place with my lack of knowledge about sheep varieties and novice interest in wool spinning. To start off the weekend, I headed straight for the woolcraft stalls. I needed to get comfortable before jumping into the sheep shearing tent. 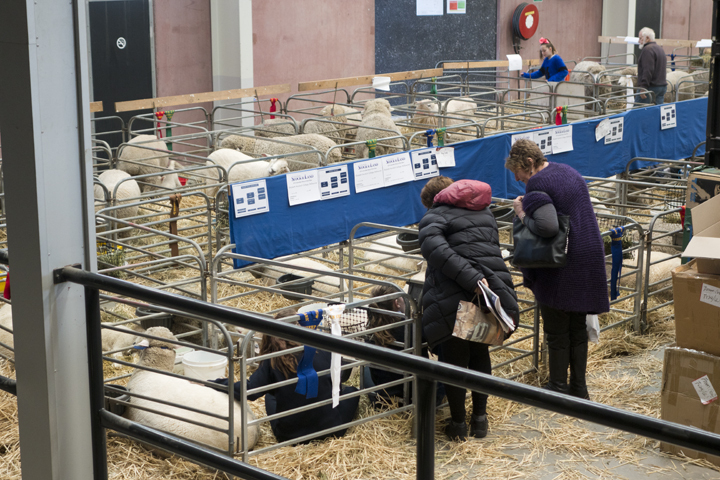 There were over 300 exhibitors ranging from raw fleece sold by the family who farmed it to outdoor companies with base layer merino for expeditions. My absolute favorite part of the show was wandering around to talk to these farmers, makers and designers. They have so much warmth. It was clear that a large part of their daily joy comes from the work they do. My favorite people were Wendy and Dave Dennis from Tarndie Homestead. A quick hello led into discussing sheep farming in Australia and the US (they noticed my Americanness pretty quickly) because Dave used to work in South Carolina. Wendy and I talked about Barbara Kingsolver. I showed them the pattern that sprung to mind as soon as I saw their yarn. It was a lovely way to begin my Saturday morning. They were, after all, the first stall I visited that morning. Wendy and Dave breed Polwarth sheep. Their ancestors developed the Polwarth line. Their farm and family is even mentioned in the Wikipedia page about Polwarth sheep! Not that I always use Wikipedia as a resource, but it's still pretty cool. Meeting this couple was a wonderful way to start off the day. The yarn I bought from Wendy and Dave is incredible. It has an ever so slight shine to it that merino lacks. It is not as soft as merino, but it definitely isn't scratchy. Instead, I would say that it seems tougher than most merino. I can't wait to start knitting with it. I even talked to Wendy about sourcing her yarn for my dyeing adventures! This is 8ply (DK) Polwarth yarn. The natural grey has been over-dyed with a bit of black. The white is un-dyed. After leaving Wendy and Dave, I found a really unique drop spindle. If you're not aware, a drop spindle is a post, usually shorter than one's forearm, with a weight that is used to spin or twist fiber to make yarn. 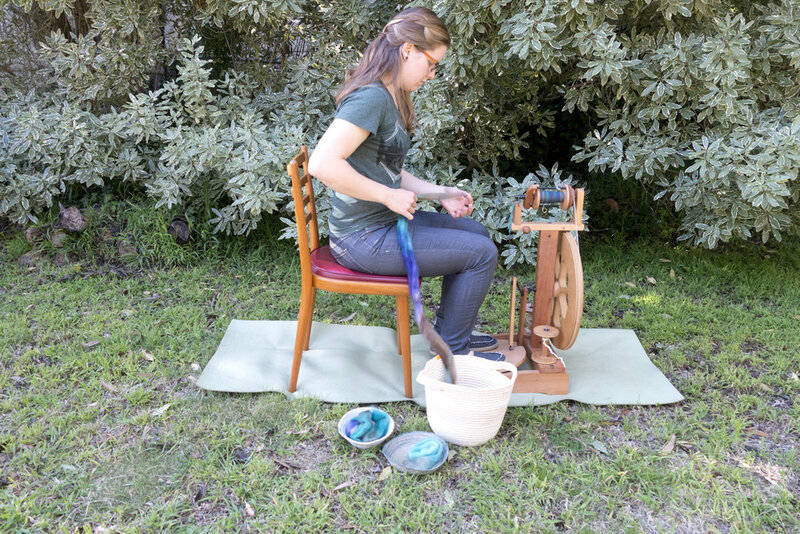 The use of a spindle is a good introduction to spinning. It helps the spinner get a feel for the twist in the fiber and slowly perfect their skills. I bought a 25g (midweight) spindle with a sprocket look to it. It spins evenly and goes for a really long time. Next up in the fair excitement is IxCHeL Bunny. Charly, the main spinner and dyer, was at the show selling her wares. She dressed up both days in quirky outfits with bunny ears to accessorize. I've not used angora before because a lot of angora farming is really bad to the bunnies. A lot of people made a beeline to IxCheL's booth. Charly answered patiently answered questions about her companies practices. I feel pretty good about giving her fleece a try. Yes, I bought some bison fleece. Who knew bison fiber was commercially useful? Speckle is all the rage, right? I'm not entirely convinced. However, I do like the added dimension of the speckle to already dyed yarn. Good work IxCheL! If you're looking for something born, bred and produced in New South Wales, look no further than Karoa Fibres. They told me the only body of water our fleece crosses is the Murray when it is spun into yarn! Their yarn was definitely a bit tougher than some at the show. They cross Merino with Bond. I still don't know much about what this means... but I will find out! I bought a bit of roving from their stall. It's a natural grey color and much softer than the yarn they had available. Finally, I hear so many yarn shops around Australia say that production mills don't exist in country. It doesn't exist which is why all of our wool gets processed overseas. From now on, I can say that's not true. Wool 2 Yarn is located on the Mornington Peninsula in Victoria. They process fleece from Australian farms!!! I can't tell you how excited I was to hear this. Alasdair was at the show. We talked as much as anyone can at a busy booth. I hope to try out his yarn for my dyeing venture in the near future. Can you see the subtle flecks of brightness in these skeins? They are a solid color, with an ever so slight 'pop' of color in them. These are reserved for family members, but I will share pictures once they are knit up! Then there were the outdoor clothing companies. Ofcourse, Icebreaker had a stall. I do love my Icebreaker leggings. In fact I was wearing them that day and told the rep I had them on... I neglected to pull up my skirt and show her. She didn't ask to see, so we were good. I was pleasantly surprised to learn about another company making base layer merino clothing. XTM performance apparently outfitted the last Australian Winter Olympics team. How didn't our paths cross until now? Oh well, I bought a shirt. I'm putting it through the paces, wearing it to work, on the plane and climbing. A full review of the shirt will be coming soon. All in all, I can't wait to share information about these companies with my indie dyer / spinner friends who have small businesses. If we want our customers to support local businesses, we should do the same. I met the lovely people behind these brands! I am excited to report on things made in Australia. 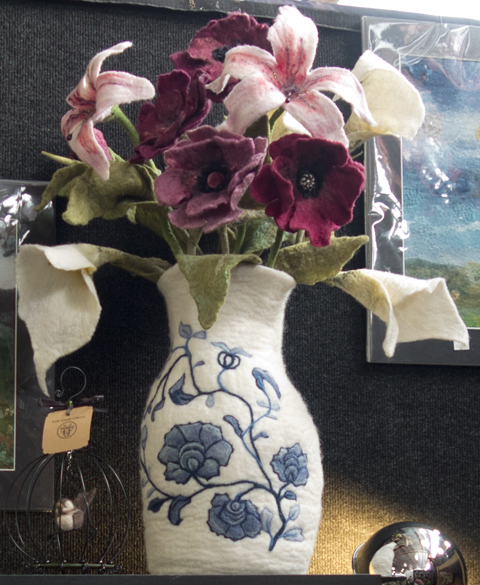 Here are a few teasers from the woolcraft section of the show. Their was a fashion show taking place in one of the pavilions. This was a very unexpected event as I didn't know about it, and new experience for me. Here are a few photos from that one... yes I sat in the front row. I figure you need to jump in on the deep side when trying something new. Then there were the sheep. 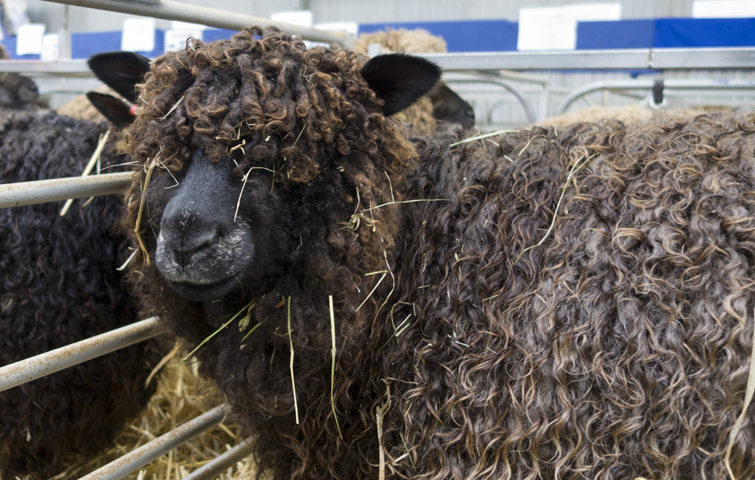 I saw sheepdog trials, sheep shearing, and a fleece competition. This part of he show was entirely new to me. I don't have much to say about it except that it was totally cool! This show gave me a lot of resources to learn more about the sheep in Australia, how they are bread, what they are used for and what they look like. I couldn't tell you the difference between the sheep in these photos. Regardless, their piercing looks struck a chord. Most of my friends are talking about the warm weather that has finally reached North America. In my house, we have given into using our little gas heater at night and hanging out in our down coats. The weather in my neck of the woods is everyone's favorite knitting/crocheting weather. I am desperately trying to finish a few old projects and drooling over a few new ones. Before I go into detail about those, take a look at the Color Affection Shawl that I just finished. Remember how my brother got me some awesome Madelinetosh yarn for my birthday? Well here is the finished product! This shawl has immediately become a staple in my wardrobe. Thanks again Big Bro! My Zig Zag sweater or the Maijapaita is so close to being done. I am working both arms at once. This is a new method for me because I usually put off the second sleeve for a long time after I've finished the first one. Come on, I want to wear you soon! Sorry for the poor photo. I have been working on my Urban Mandarin one while I'm in the car. Seriously though, I'm drooling as I think about it. This is my first fair isle sweater. I am not 100% satisfied with my tension, but it's my first try. I am using Manos del Uruguay Fino. More updates will come soon. I am about half way done with the body. This photo is a bit old. I bought the yarn at my shops sale this past week for the Golfjes skirt. I said I wouldn't buy it until I finished one of the other sweaters... I am so weak! This is my first skirt. Hopefully mine will look more like Vanek's Golfjes than the sample. I will share a picture when I cast on... After I finish the Zig Zag (Maijapaita) Sweater! That's all folks. Happy Crafting!